This recipe calls for you to grill the corn, as it brings out the natural sugars and adds a wonderful caramelized flavor to the salsa. If that step seems too time-consuming, or you aren’t planning to fire up a grill for the rest of your meal, here is a simpler alternative: Remove the corn from the cob with a knife and pan-roast the kernels in a heavy-bottomed frying pan, preferably cast iron, over medium heat with two teaspoons of olive oil until they are caramel brown. Be sure to stir frequently so the corn doesn’t blacken. Another option is to use an indoor grill pan and grill the corn as directed for outdoor grilling. 1. Prepare a medium-hot fire in a charcoal grill/barbecue, preheat a gas grill/barbecue on medium-high or place a stovetop ridged grill pan over medium-high heat. 2. Pull back the husk from the corn without actually removing it. Remove the silk and brush the corn with 1 tsp of the oil. 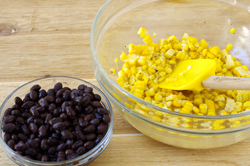 Sprinkle the corn lightly with ¼ tsp of the salt and a little pepper. Pull up the husk to cover the corn and twist at the top to enclose the corn. 3. 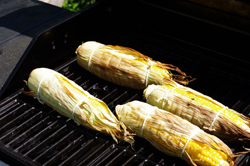 When the grill is hot, arrange the corn on the grill grate directly over the fire. Cover the grill and cook the corn on one side, for about 5 minutes. Turn the corn and cover the grill again. Give the corn one more turn and continue grilling just until the corn begins picking up color without blackening, about 2 minutes longer. Remove the corn from the grill and let cool. 5. Stand the ear of corn upright, stem-side down, on a cutting board. 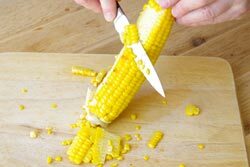 Using a sharp knife, cut downward along the cob, removing the kernels and rotating the corn a quarter turn after each cut. 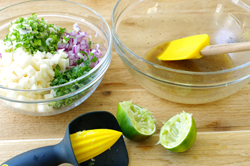 Discard the cob and scoop the kernels into the bowl with the dressing. 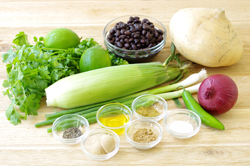 Add the beans, jicama, red onion, and Serrano chile. Gently mix to coat with the dressing. 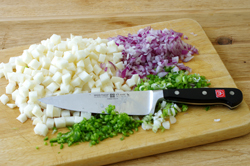 Fold in the green/spring onions and cilantro/fresh coriander Taste and adjust the seasoning. Transfer to a serving bowl, cover, and set aside for at least 1 hour to allow the flavors to meld.